Since its opening in early 2002, the Queens Cancer Center has often been referred to as the crown jewel of NYC Health + Hospitals/Queens. For the past eight years it has consistently delivered unsurpassed, comprehensive care to our oncology patients. In addition to administering superb medical and therapeutic services, the Cancer Center engages in efforts such as The LibraryHealth Project, clinical research studies, and the Queens Quits tobacco cessation program. 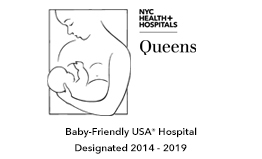 Queens Cancer Center has become an ambassador in facilitating educational programs, cancer screening and early detection throughout the borough of Queens. Our reputation precedes us as we are well regarded as an institution for providing excellent cancer care to all of our patients. Our comprehensive cancer program promotes a patient-centered approach whereby all services revolve around the patient in a picturesque, aesthetically pleasing and soothing environment. As an expansion to our state-of-the-art technology, a PET-CT scanner was introduced in August 2007 which has revolutionized imaging and allows physicians to pinpoint the exact location of the cancer in order to make treatment decisions and recommendations. Queens Cancer Center consistently offers the latest technology to help diagnose and treat cancer in a timely and efficient manner. Our chemotherapy service offers the most advanced chemotherapy drugs to all our patients with no barriers to equity in services. Looking for a dynamic, compassionate place to receive cancer care that will make a tangible difference for you or your loved ones? Choose Queens Cancer Center, a revolutionary facility where we pride ourselves in promoting life-sustaining measures and upholding a true quality of life for every patient who walks through our doors. Call 718-883-HOPE (4673) for more information about the Queens Cancer Center.